David Weekley Homes team members present Ronald McDonald House Charities of Jacksonville with a check during the third annual David Weekley Homes World’s Largest Showcase of Homes. Jacksonville, FL (May 17, 2018): The nation’s largest privately-held home builder celebrated more than 40 years of Building Dreams, Enhancing Lives by hosting the third annual David Weekley Homes World’s Largest Showcase of Homes. From April 1-30, more than 8,700 visitors stopped by model or showcase homes across the country to see current innovations in design and décor trends. 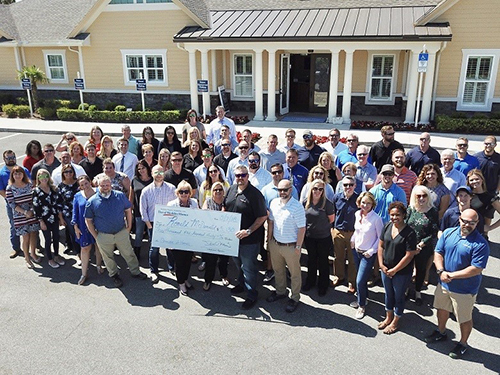 As part of the company’s charitable and philanthropic efforts, a $5 donation was given to a local nonprofit organization for each visitor who registered with a sales consultant during David Weekley Homes World’s Largest Showcase of Homes, amounting to more than $43,000 for 19 local charities. In Jacksonville, more than $3,100 was donated to Ronald McDonald House Charities of Jacksonville. The monetary gifts are one of the many ways David Weekley Homes lives out its purpose, Building Dreams, Enhancing Lives, in all the communities in which it builds. The builder joins with team members, homeowners and community partners to engage with communities to make a difference through volunteer and philanthropic efforts. “It was one thing to share with our customers that we were donating this money to Ronald McDonald, but it’s another that we were able to go there and experience what our donations were going toward and be able to share that with our community!” said Jennifer “JJ” Jeffreys, lead sales consultant for the Jacksonville division and CARE committee member. For more information about David Weekley Homes in Jacksonville, visit www.davidweekleyhomes.com. Ronald McDonald House Charities (RMHC), an independent non-profit 501 (c) (3) corporation, creates, finds and supports programs that directly improve the health and well-being of children and their families. Through its global network of local Chapters in 62 countries and regions, its three core programs, the Ronald McDonald House®, the Ronald McDonald Family Room® and the Ronald McDonald Care Mobile®, and millions of dollars in grants to support children's programs worldwide, RMHC provides stability and vital resources to families so they can get and keep their children healthy and happy. All RMHC-operated and supported programs provide access to quality health care and give children and families the time they need together to heal faster and cope better.